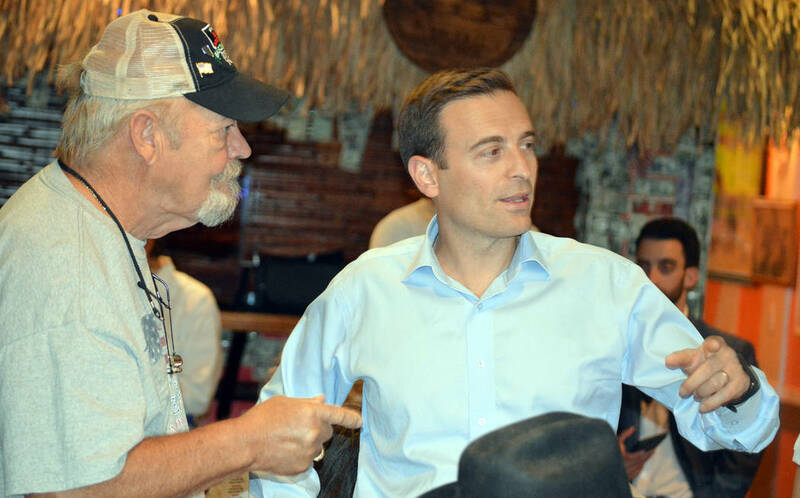 Boulder City residents had the opportunity to speak with Nevada Attorney General Adam Laxalt on Tuesday during his visit to discuss his recent decision to run for governor of Nevada. 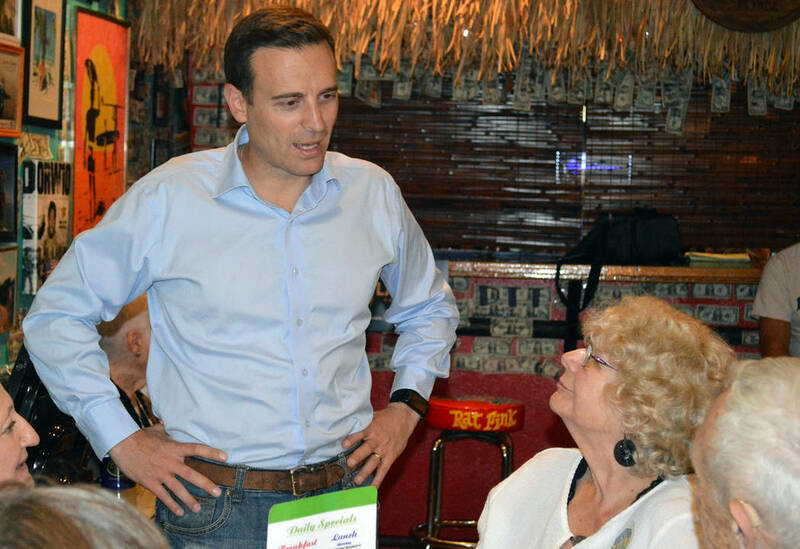 Celia Shortt Goodyear/Boulder City Review Nevada Attorney General Adam Laxalt talks with Norma Barth at the World Famous Coffee Cup in Boulder City on Tuesday, Nov. 7, about his candidacy for Nevada Governor. Celia Shortt Goodyear/Boulder City Review Nevada Attorney General Adam Laxalt, right, answers a question from Jerry Newman at the World Famous Coffee Cup in Boulder City on Tuesday, Nov. 7, about his candidacy for Nevada Governor. Laxalt, a Republican, kicked off The Laxalt 17 Tour on Wednesday, Nov. 1, in Las Vegas and announced he was running for governor. During the seven-day-tour, he visited each of Nevada’s 16 counties plus Carson City. His stop at the World Famous Coffee Cup in Boulder City on Nov. 7 was the second to last stop of the tour. During his speech, he told residents that as governor jobs would “first and foremost” for him and that he would focus on providing more jobs and better jobs as well as the education and training to have good jobs in the state. He also said that he wanted to make Nevada the most economically developed state in the West and provide growth opportunities to both small and large businesses. Education and public safety are two other areas Laxalt said that he would focus on as governor. “It’s unacceptable that we’re at the bottom,” he said about the state’s public education system. With it, he said that he plans to take an “all above approach” and implement reforms in public education. “I look forward to rolling out detailed policies,” he said. Laxalt thanked those who came to hear him and gave them an opportunity to ask questions and speak with him after his presentation. “This is going to be a long campaign … We’re going to need a lot of you to build a foundation this first week and continue through next year,” he said. Laxalt and his wife have two daughters with a son on the way and live in Reno. Resident Jerry Newman came on to hear him speak because he is concerned with where the state is going especially with Second Amendment rights and education. For Laxalt, he said that the best thing about his 17-county, statewide tour is being able to meet many different people and to hear their stories, especially when he can relate to them. Laxalt was raised by a single mom and didn’t know his father while he was growing up. He also struggled with drinking and entered a treatment program when he was a teenager. Laxalt was sworn into office as Nevada’s Attorney General on Jan. 5, 2015. He is a fourth generation Nevadan and former Navy Lieutenant who served as a judge advocate general. He also volunteered to serve in a combat zone in Iraq. The 2018 Nevada gubernatorial election takes place on Nov. 6, 2018, with a primary election happening in June. Current Nevada Gov. Brian Sandoval is not eligible for re-election because of term limits.